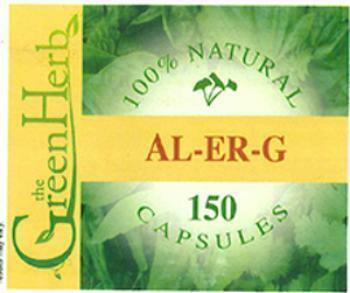 MusclMasster of Wheat Ridge, Colo., is recalling all bottles of Al-Er-G Capsules containing ephedra herb, an FDA banned ingredient. Dietary supplements containing ephedrine alkaloids pose a risk of serious adverse events, including heart attack, stroke and death. No illnesses regarding the product have been reported to date. This recalled product was distributed from the company's wellness center and retail store in Colorado. In addition, one bottle each was shipped to Wyoming, South Carolina and Washington. The products does not contain UPC codes or expiration dates, but has a lot number of 314. This product, used as an allergy supplement, is packed in a white bottle with a white cap containing 60 or 150 capsules. Each 650 mg capsule contains 180 mg of ephedra herb. Customers who purchased the recalled product should return it to New Genesis Health, 4565 Kipling Street, Wheat Ridge, CO 80033 for a full refund. Consumers with questions may contact the company at (800) 765-4372 Monday-Friday, 9am-6pm (MST).